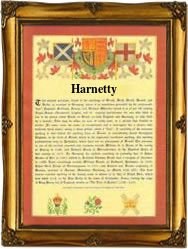 This unusual and interesting name is a dialectual variant of the Irish name O' Hartnett or O'Harney. Its early anglicized form O' Hartnedy which occurs frequently in the 16th Century Fiants, is closer to the Gaelic "O' hAirtneada" which is composed of the elements 'airt' stone, and 'neada' nest, thus meaning a stone lodge or settlement. The name is from West Munster, and families of this name are mainly located in Counties Cork, Kerry and Limerick. In Grean, Tipperary one Heonora Harnetty was born to William Harnetty and Mary Collins on 30th April 1864. The first recorded spelling of the family name is shown to be that of Ellen Harnetty, which was dated at Drimolegue, County Cork, 1864, during the reign of Queen Victoria, known as the Great White Queen, 1837 - 1901. Surnames became necessary when governments introduced personal taxation. In England this was known as Poll Tax. Throughout the centuries, surnames in every country have continued to "develop" often leading to astonishing variants of the original spelling.